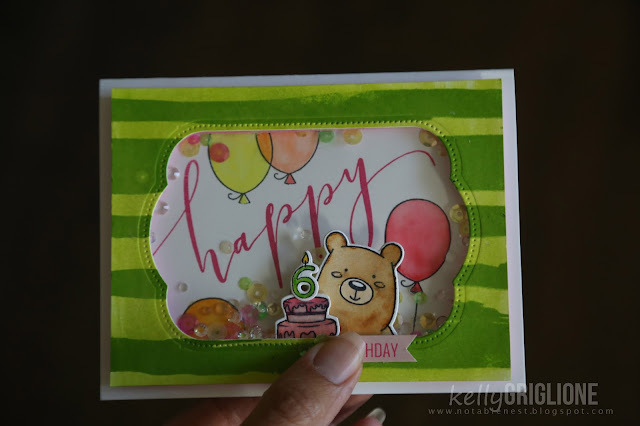 To start, I stamped the balloons from Kobi the Birthday Bear and the sentiment from Happy on the card base. For the shaker part I cut out a window from Dotted Patterns 1 on another piece of paper, and then traced along the inside of that shape on my card base so I knew what part of the background will be visible. I also traced around the bear head and cake so I knew where I could hide the battery and lights. This is where I put my battery holder. Here's a peek at the guts of the card. Copper tape runs from the battery holder to two lights which will be behind the bear head. You'll also notice that I cut a section of the foam window away to make room for the battery. Then it's a matter of pouring the shaker mix in (which came from Lev's Creations, Katia's adorable little son who makes a custom mix for you!) The green brush strokes are from Brush Stroke Stripes. The accessories that come with Kobi are really fun to add to your card, and in this case, helped to hide the battery even better. Love the numbered candles for his cake! Here's a shot at all the supplies, except the brush stroke stripes. The lights are of course from Chibitronics. Shall we see him in action? Kobi lights up! The best thing about this is that all the shaker mix elements sparkle and shine like crazy, since the light hits all the facets in the sequins. 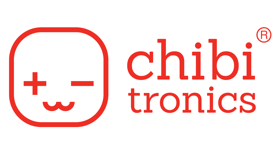 To see more great projects from these two companies, head over to the Chibitronics blog. Not only that, but you can comment to win a prize pack including a Starter Kit from Chibitronics and a $50CAD store credit to Studio Katia! Hi Folks! 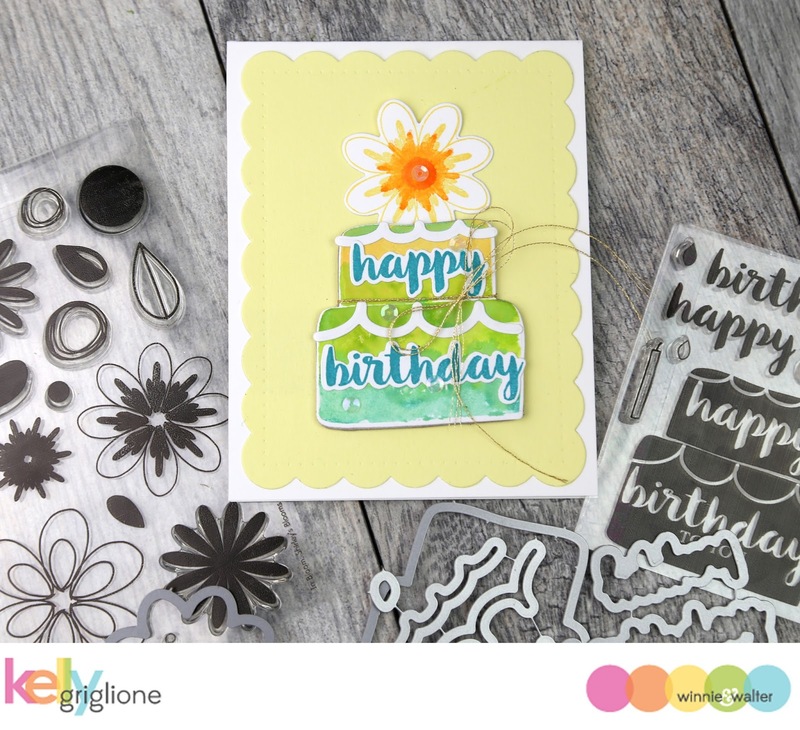 We've got another birthday stamp set to share today, this one is Ring in the Celebration and has a ton of different circle designs of various sizes to mix and match. For this card I stamped all the background circles in the same yellow color, and then for the focal point I used different colors. I love that the outer circle is made up of birthday candles! So cute! 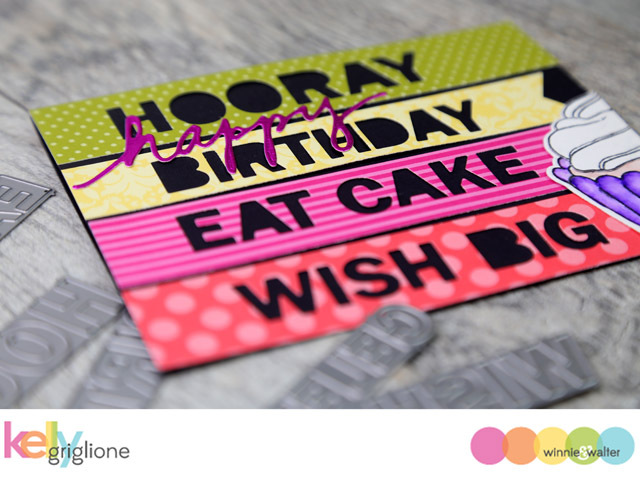 The "happy" sentiment is from In a Word: Happy, and "birthday" is from In a Word Birthday Tiles. Along with all the different circles in this set, there are a few things to put in the centers, like this adorable tiered cake with the teeny-tiny little heart on top. I used the corresponding cutaways to die cut the cake and put it in the middle of the sentiment. The larger sentiment is from a set we'll look at tomorrow. 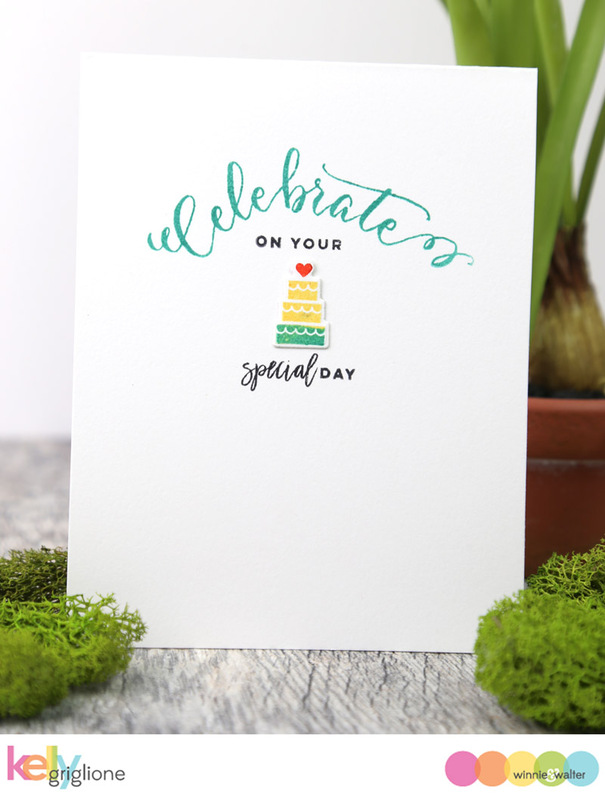 The smaller sentiment is from Sentimental: Gift which is actually free with a qualifying purchase! Such a great mix of fonts and sentiments. I will be using this one quite often! Two different styles of cards here, both using the same Ring in the Celebration set. 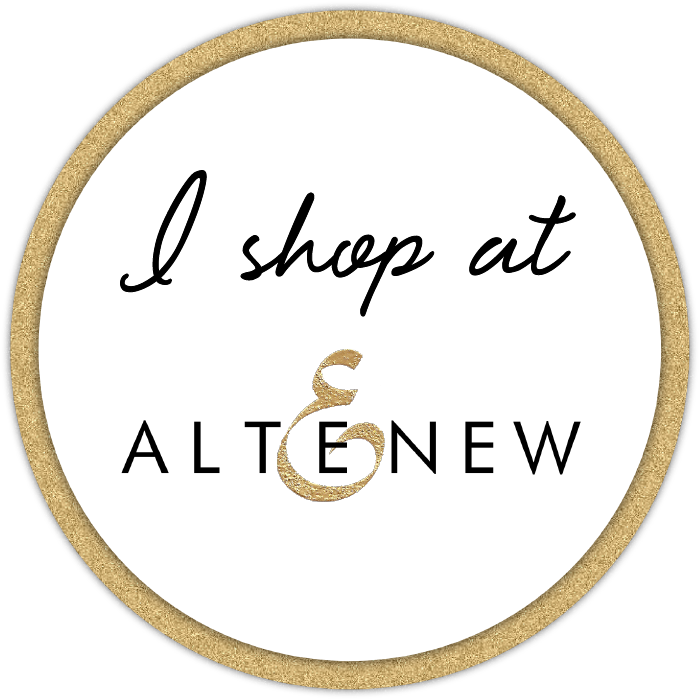 Be sure to check out the other amazing projects on the Winnie & Walter blog. As usual, leave a comment there for a chance to WIN all of today's goodies. The Big Giveaway is also going on with a chance to win the entire release!! Of course, there's a ton more inspiration on the personal blogs of our Talent, so check those out if you get a chance. We've got one more day left before the stamps and cutaways are released! Hello! Are you ready for more birthday treats? 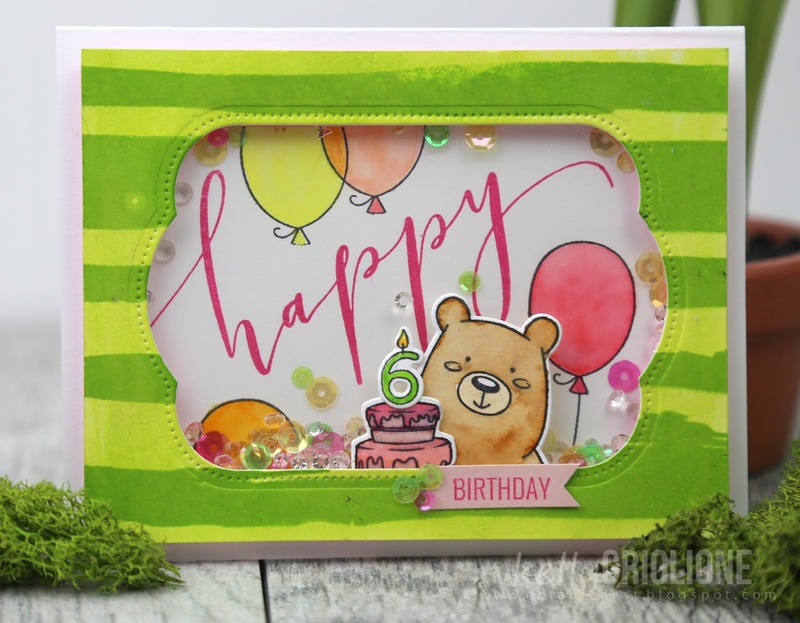 Today we are showing a few more birthday sets from Winnie & Walter, including this birthday cake from Happy Birthday to You. To color the cake I inked the stamp and then used a watercolor brush to spread the ink around before stamping it on the paper. The coordinating Happy Birthday to You cutaways that I used to cut the birthday cake even have coordinating frosting! Yum! 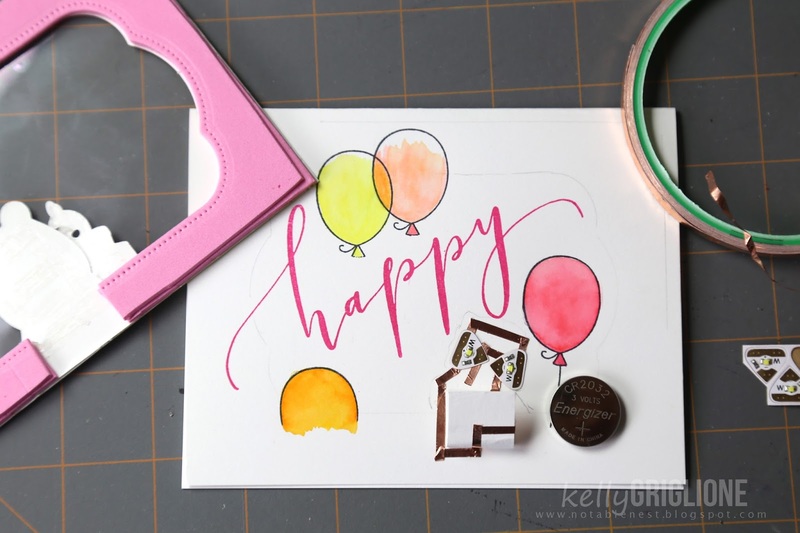 Although the birthday cake stamp comes with the sentiment right on it, I added the separate, die cut "happy birthday" sentiment to the cake. 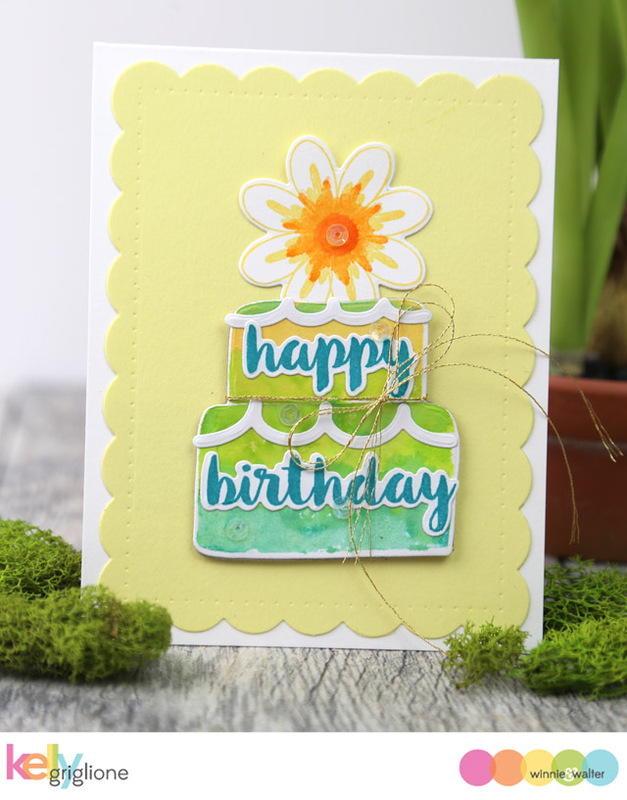 Instead of candles on top, I added a cheery flower from In Bloom: Shirley’s Blooms stamp set and coordinating cutaways. 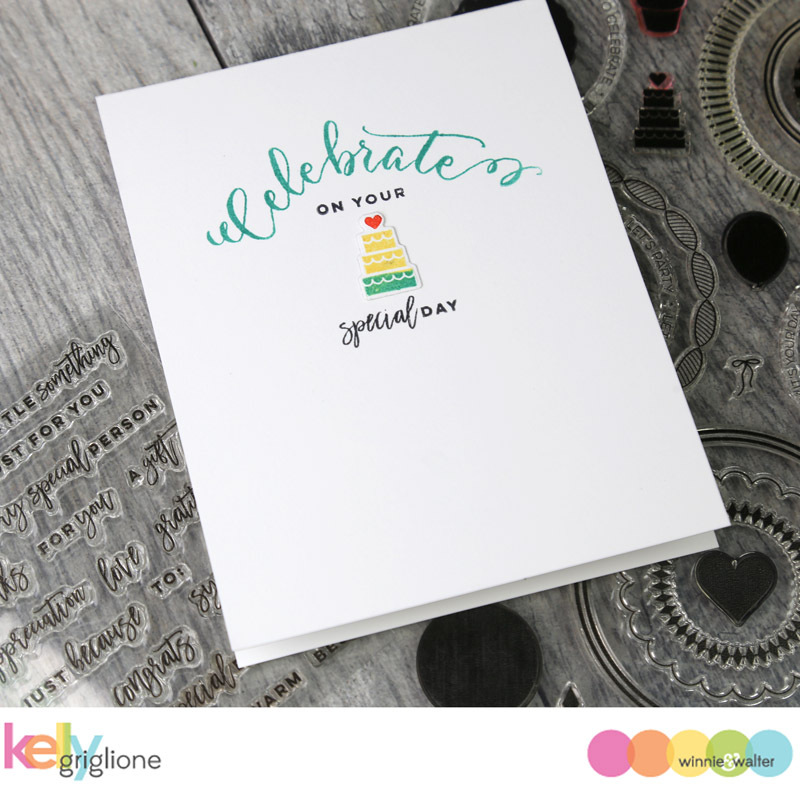 It's inked the same way as the cake, by adding water to the ink before pressing the stamp on the paper. Hi Folks! 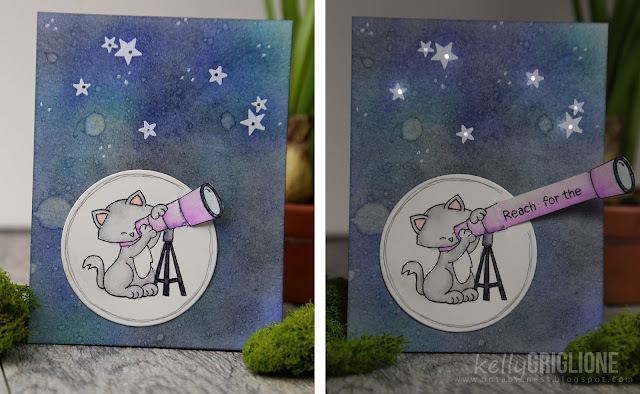 I'm so happy to share a new release from Winnie & Walter with you this week! This is the first of four days where we'll be showing projects with all the new goodies. 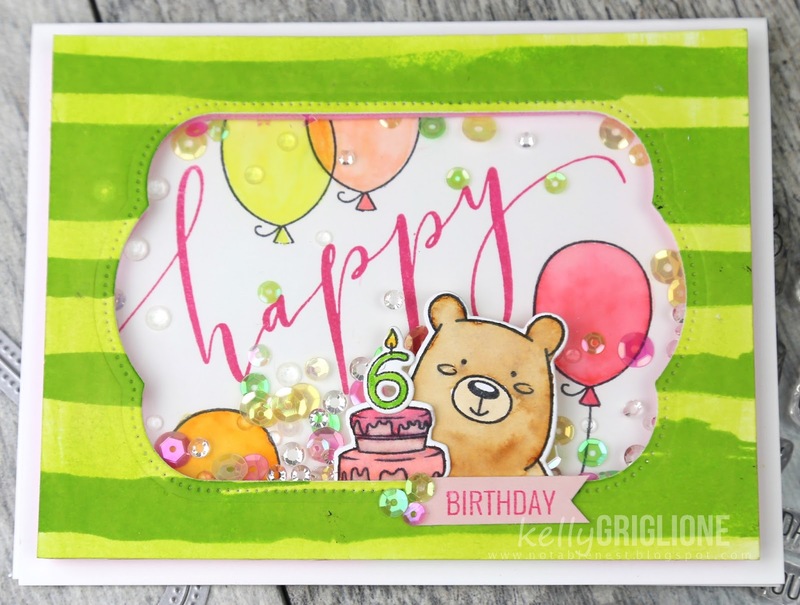 The big theme for many of these new stamps and cutaways is ... birthday! Yay! Just what I use the most! 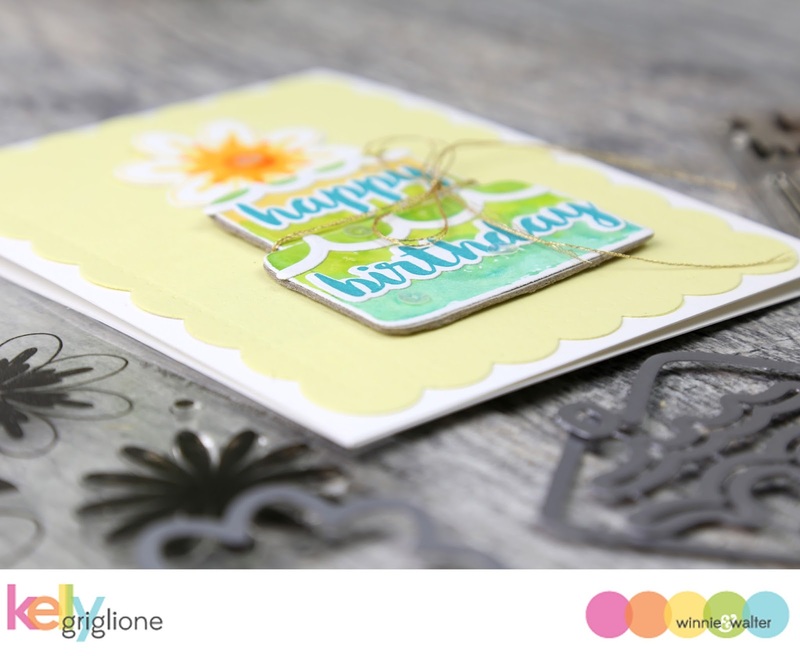 This colorful card uses the In a Word: Birthday Tiles Cutaways to fill the card with sentiments. 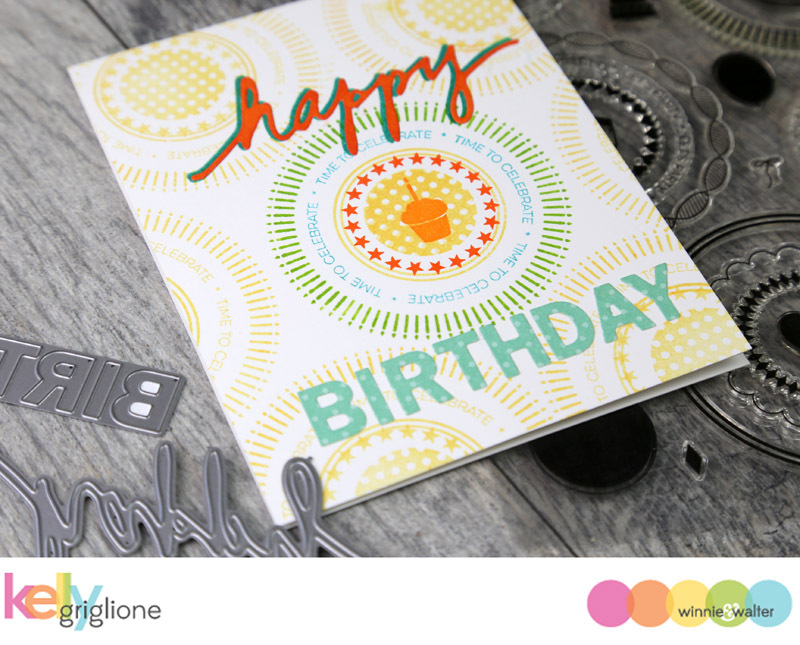 I added "happy" from In a Word: Happy Coordinating Cutaways to make it an official "happy birthday" card. 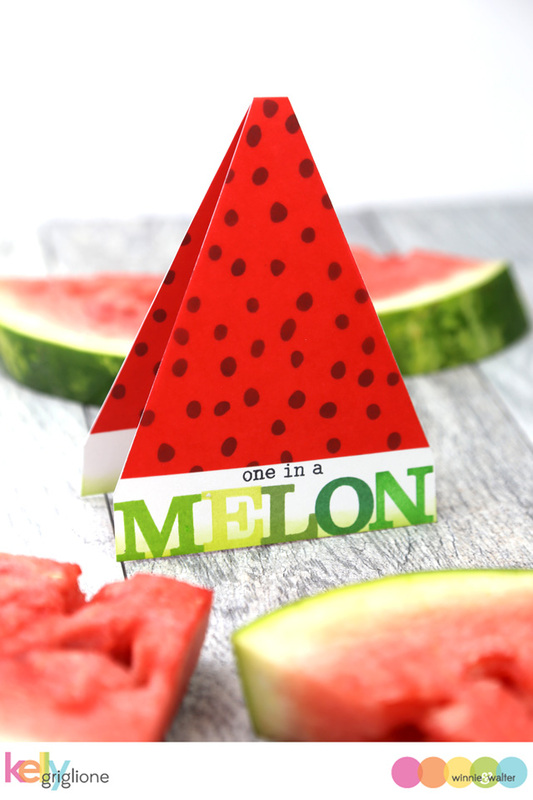 I made several extra strips while I was cutting so I could make a few of these cards. There's a sweet cupcake on the side that we'll see more of later this week! 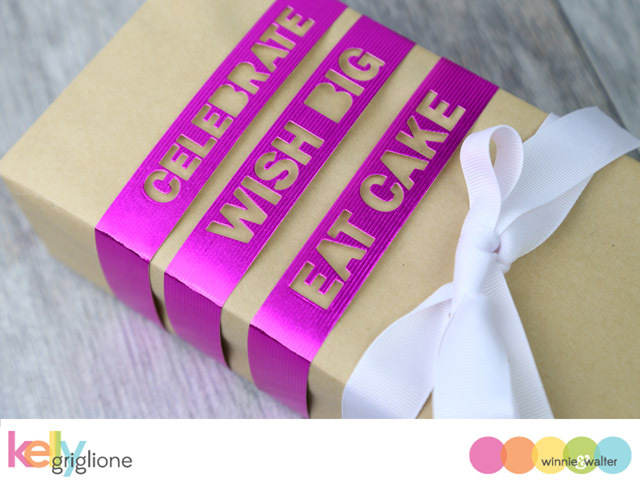 Another project that just took a few minutes is bands to wrap around your packaging. 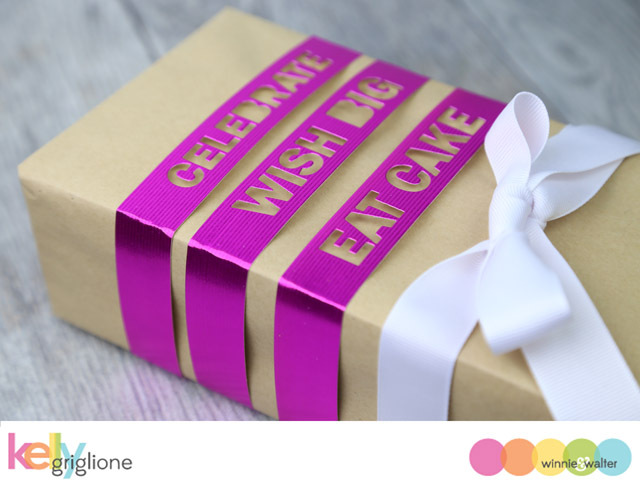 No need for a card here, just say it all right on the present! This would be great to use for a man's present too ... ditch the bow and cut the words out of strips of solid black paper for a completely different look. 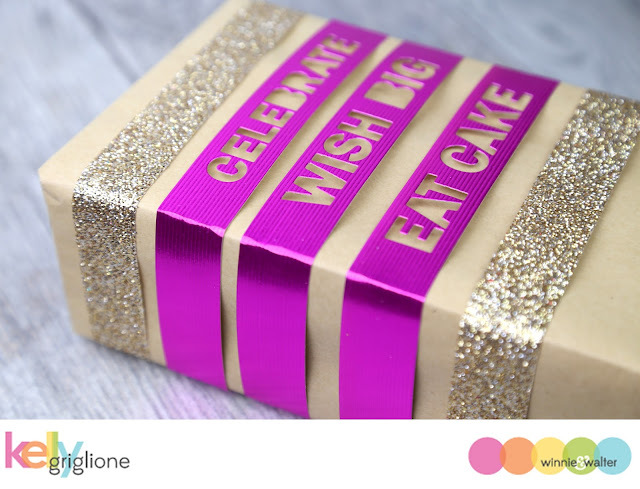 Or just swap the bow for some glitter ribbon bands! Wouldn't you be dying to know what's inside?! 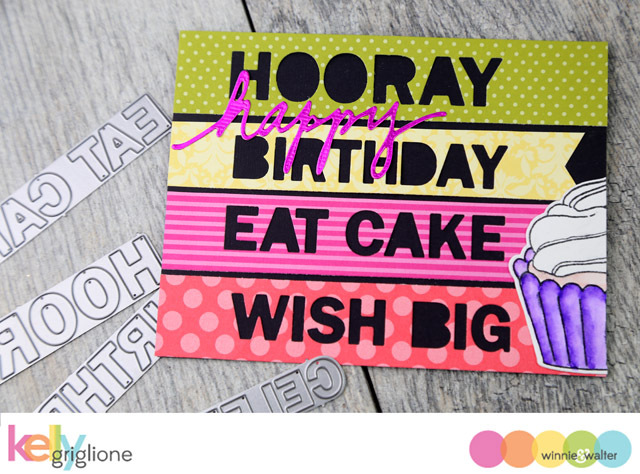 So many ways to use these words, I know they will be a staple for my birthday cards! Hope to see you here over the next three days ... there are so many things to show you! Hi Folks! Great news, the popular Tutu set from the latest CAS-ual Fridays release is now back in stock! 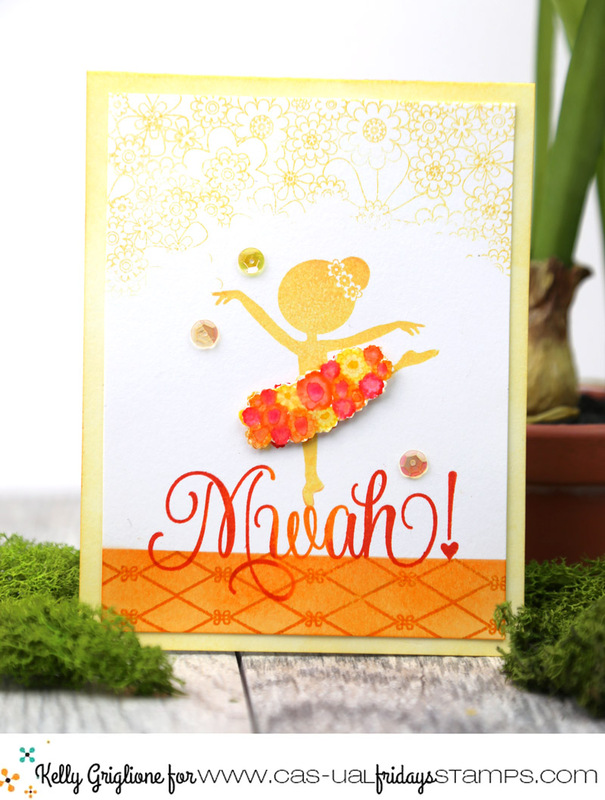 These adorable ballerinas with the pretty floral tutus are about all you need for a little girl's birthday card. Aside from stamping the ballerina, I just stamped a birthday sentiment from Whole Shebang repeatedly across one of the blended sections. Done! Hi Folks! You may have noticed the Chibitronics and Newton's Nook design teams have been having a lot of fun together this week showcasing how the adorable Newton's Nook stamps can look paired up with the magical Chibitronics lights. You can join in on the fun by leaving a comment on the blogs throughout this week for a chance to win a $30 starter kit from Chibitronics or a $30 gift certificate to Newton's Nook. Winners will be randomly chosen at the end of this week! My card features the adorable Cosmic Newton peering through his telescope at the night sky. Only problem is, his lens isn't quite long enough to find the stars he's looking for. That's where you come in. Once you help Newton extend the lens by pulling on it, he's finally able to see all those stars twinkle in the night sky! To make the telescope extension piece, I stamped the end of the telescope on a separate piece of paper and cut parallel lines to make a long strip. Then I cut a slit in the main telescope image, slid the telescope lens in and adhered a T stop so the lens can't come all the way out. This allows you to slide the lens in and out. To make the lights go on and off, the strip is wrapped in copper tape and will complete the circuit as it's slid along the battery underneath the panel. To give the stars an extra glimmer and shine, I punched tiny holes in the center so they will really twinkle when the circuit is connected. This one was super fun to make! 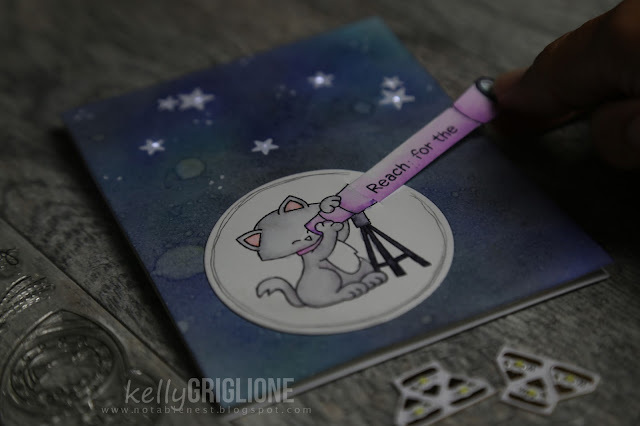 I like that once you finish sliding out the telescope and reading "Reach for the," the stars turn on to finish the sentiment without having to stamp the actual word "stars." Don't forget to stop by the Chibitronics blog to see the other cards featured today. Hi Folks! 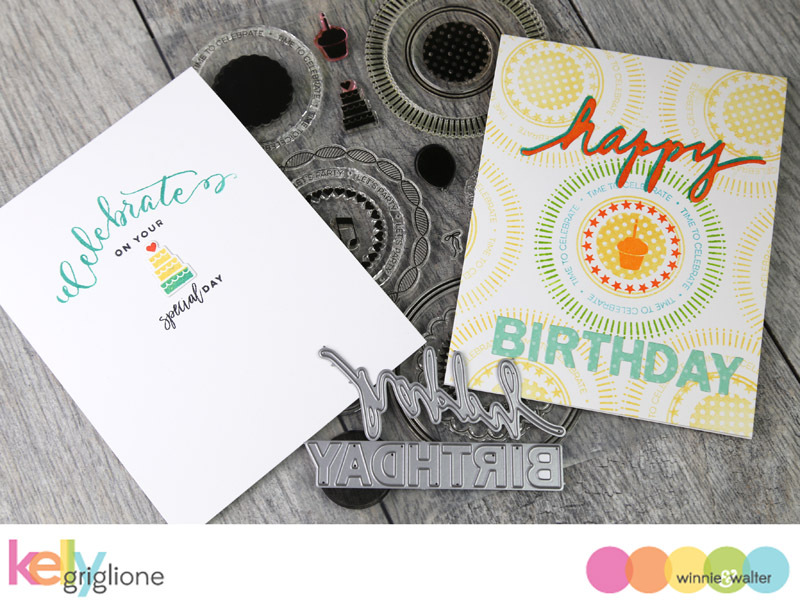 I'm excited to share a project inspired by the most recent edition of The Gossip Column by Taheerah Atchia on the Winnie & Walter blog today! Each month Taheerah puts so much effort into her fascinating articles. 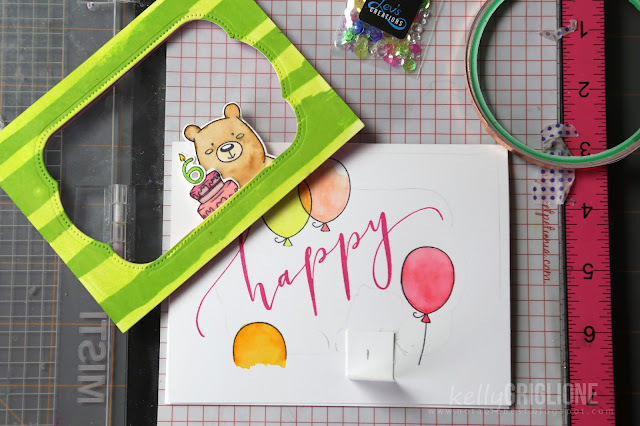 If you are inspired like me, don't forget there are still two weeks left in the contest where you could win generous Winnie & Walter gift certificates just by linking up your project! Hello Folks! 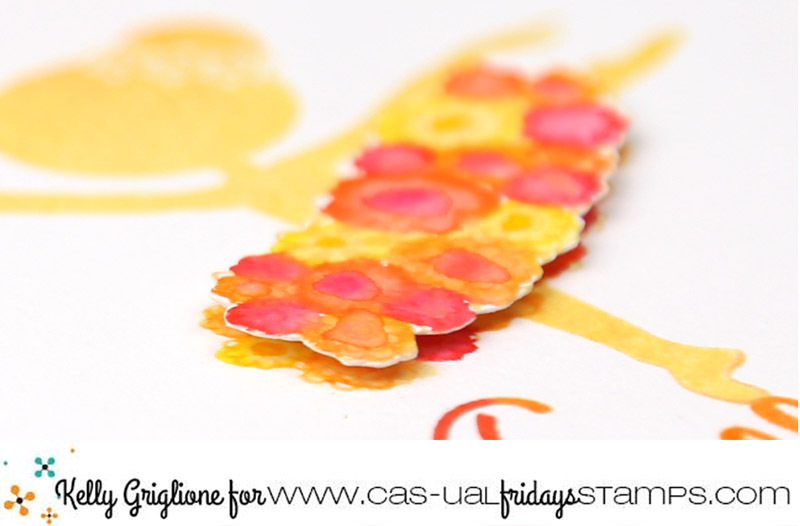 Today the fabulous teams at CAS-ual Fridays Stamps and CardMaker Magazine are joining forces to showcase all things floral. Fun! You may have come from CardMaker Magazine, but if not, feel free to head there to hop from the beginning. 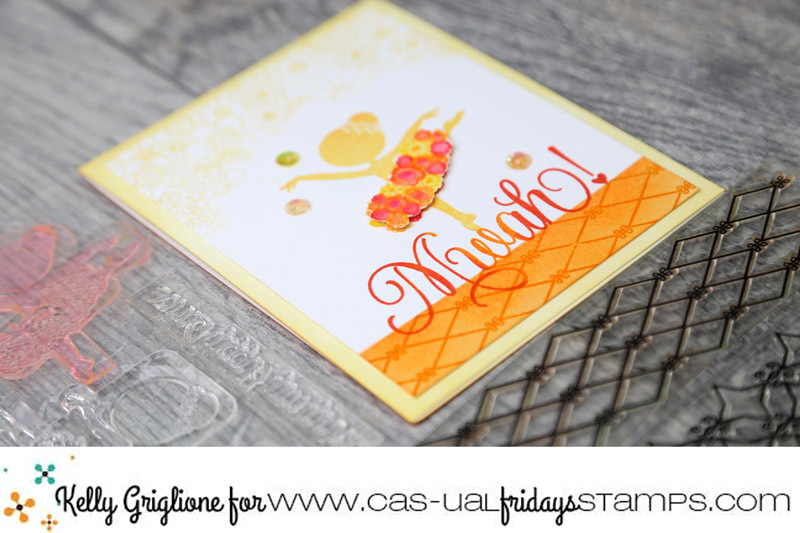 This card uses several old and new CAS-ual Fridays Stamps, featuring a twirling ballerina from the popular Tutu (which is now back in stock), a sentiment from Puffy Heart Love, a subtle border of flowers on top from Full on Floral, and a textured ground from Starlequin. Lots of different sets, but they all go together so well! For the tutu, I loosely watercolored the different flowers, and then decided it would be fun to make an additional tutu and layer on the first to let it really shine. After masking off all but the bottom of the card and sponging ink to ground the sentiment, it still looked a little unfinished, so I stamped the harlequin pattern in the same color ink. The "Mwah" sentiment is inked with the lighter color orange first, and then some darker orange colors on the ends. If you're in the mood for these, or other florals, there is an entire Florals section at CAS-ual Fridays. Don't forget, you can use the KELLY2017 code to get 15% off any of your stamp or die purchases there. 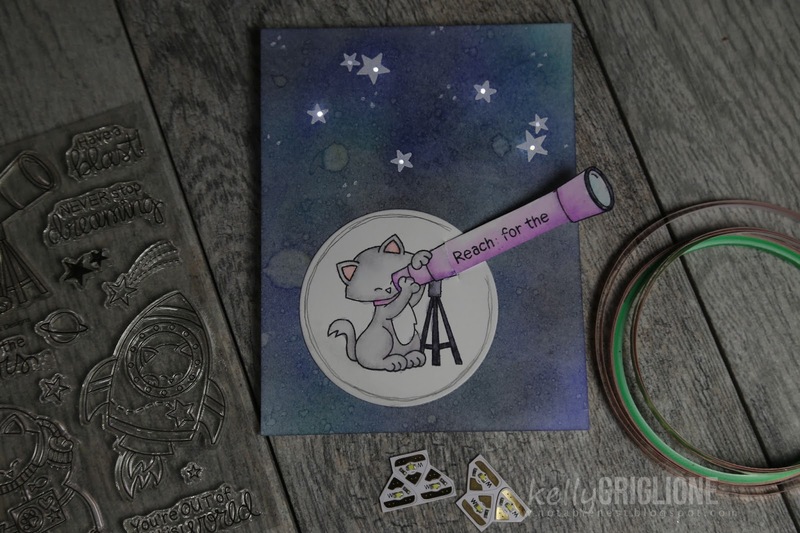 Your next stop on the hop is Jen Shults, who I'm sure has something gorgeous to share with you! Hi Folks! It's time to bring out another oldie but goodie at Winnie & Walter for the Rerun Challenge! 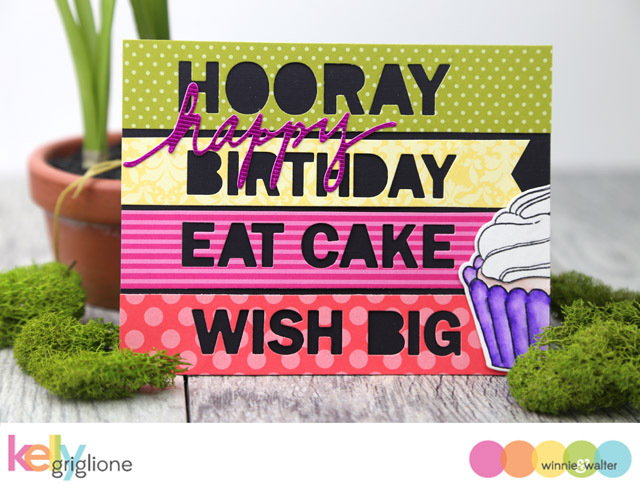 This month we're featuring the birthday staple Sugar Rush. 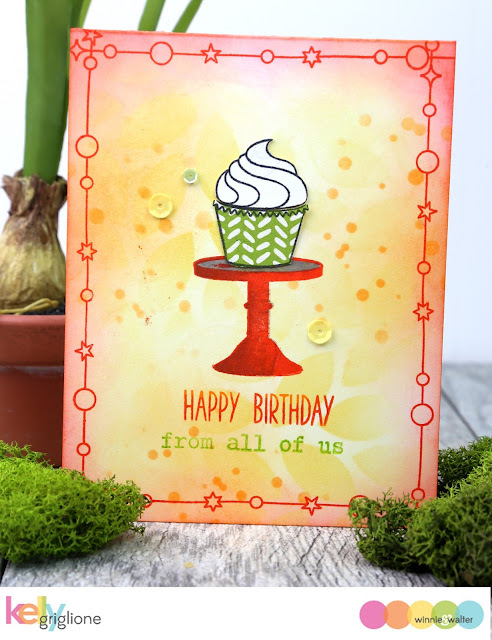 I've always loved that cupcake piled high with frosting, and the cute cake stand. 1) Pick three warm or cool colors. After making a few pages following these guidelines I decided to see what would happen if I made a card in this same manner. For the stencils I used Creative Screenings Scenery: Big Bang Circle, and Scenery: The Leaf Effect, and the border is from Scenery: The Party Hangover. It was a very fun experiment in letting go and not planning anything before putting ink to paper. 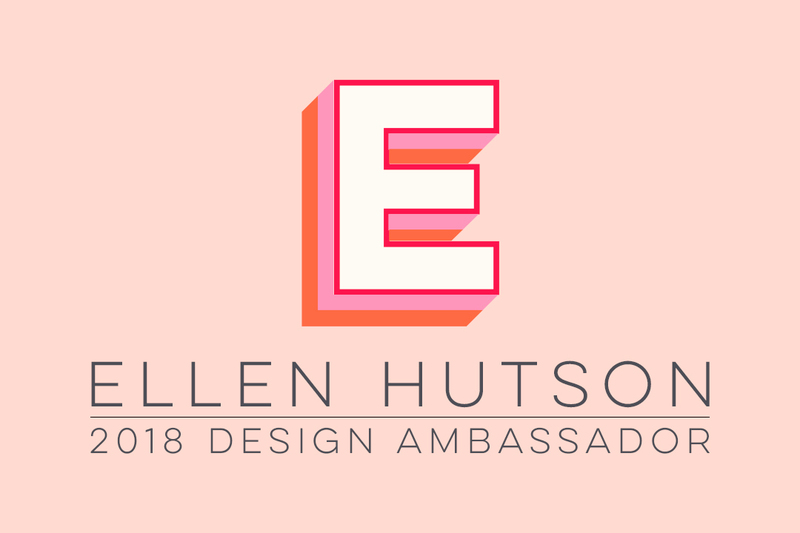 Great news, we have a winner of the FIFTY DOLLAR GIFT CERTIFICATE to Ellen Hutson!!! Mr. Random picked Ms. Anita From France! Anita, you have some serious shopping to do! Also thanks very much to Teresa Doyle for the note on this! Hi Folks! 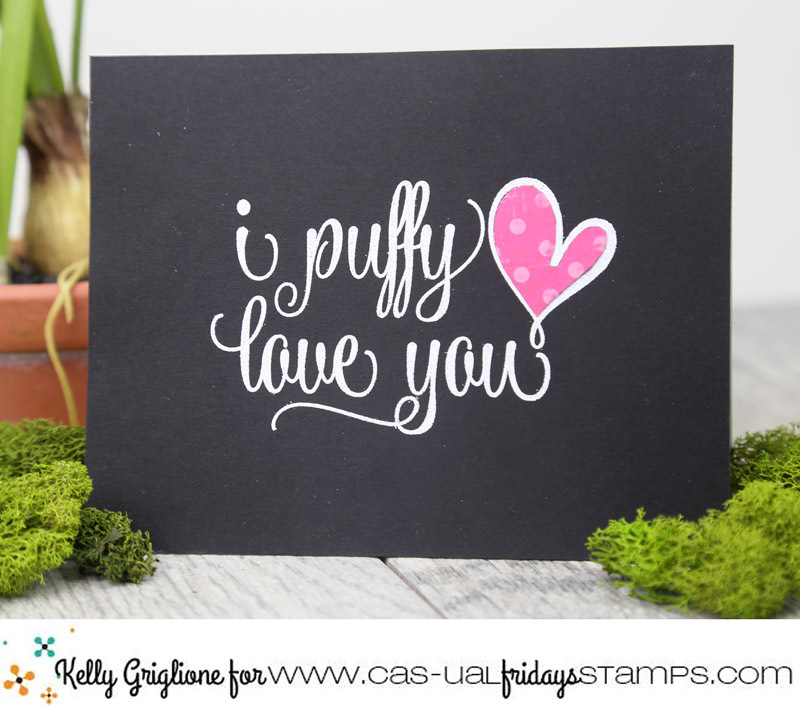 It's official, I puffy heart love the new set from CAS-ual Fridays Stamps called ... Puffy Heart Love! What's not to love about this beautifully scripted font that incorporates a heart? 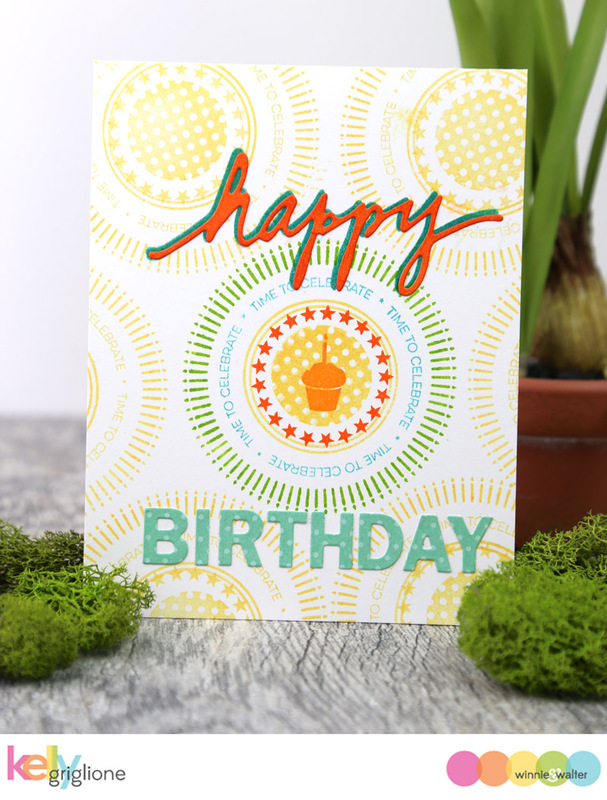 It's the kind of stamp that can absolutely carry a card all on its own, without any other embellishments. 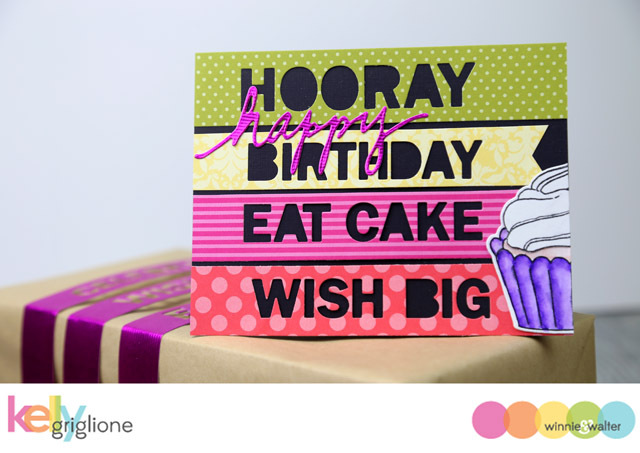 For this card I stamped the sentiment directly to the black card base, and then again on the pink patterned paper. I cut inside the lines of the pink heart and adhered it on top of the black base. 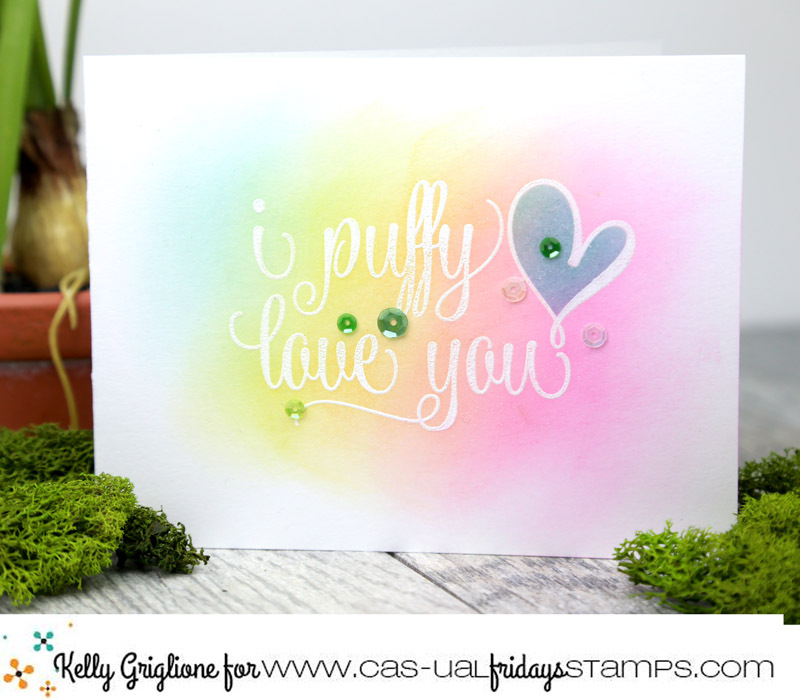 The sentiment on this card is similarly embossed in white, and then I blended a rainbow of inks on the card base. After I was done I wasn't thrilled with how the heart blended in with the rest of the sentiment, so I made a mask by stamping the sentiment on a scrap piece of paper, cutting out the inside of the heart, and using it as a stencil to blend blue ink inside the heart. 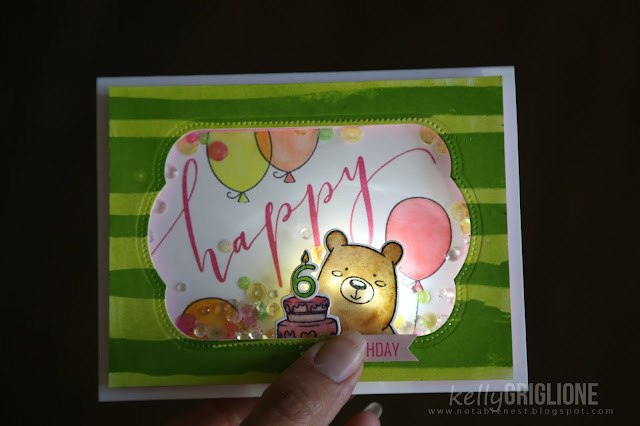 After I was done, I just couldn't throw the stencil scrap away, so it got turned into a card! It's the bottom left card. Since I only intended to use it for a stencil, the black ink does not have a solid impression, but I thought it had a nice shabby chic look to it. The ink from the stenciling makes a nice spotlight on the heart. And since the inside of the heart was missing, I was able to easily see what patterned paper looked good by holding the stencil over a bunch of different patterns. There are several other cute sentiments in this set, but I couldn't stop using the puffy heart one. 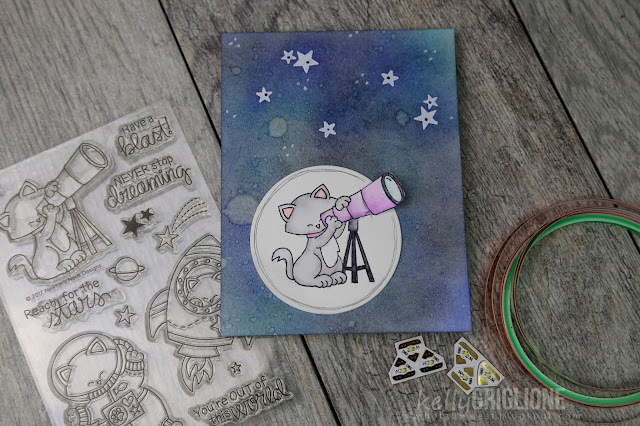 Check out the rest of the Ink Squad to see more awesome projects with these stamps. 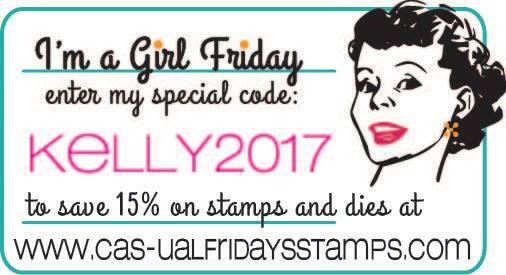 All the stamps you see this week will be released TODAY! And don't forget, the code KELLY2017 works on everything, including retiring items, sale items, and even these new release items.